Adversary's 'Singularity' is a perfect example of what's good and bad about current modern American metal. Before the good news, a little overview: Adversary hails from that unknown metal haven of Manassas, Virginia. Some pundits have dropped them in the post-thrash category of groove metal (which could include the likes of Cavalera Conspiracy, Lamb of God, or Machine Head). But I think the verdict is still out, if only because Adversary can also deliver traditional thrash, metalcore, and (believe it or not) old school melodic heavy metal. Therefore, in some peculiar sense, they could be considered a modern (extreme) progressive metal band like Into Eternity (without the maturity and sophistication). Genre identification is ultimately a fruitless enterprise, so let's move on to my original proposition. So how does Adversary's 'Singulariy' display the best of modern American metal? 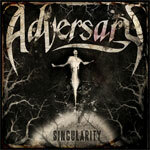 First, in their finest moments, Advesary delivers some fine melodic heavy metal with great clean vocal arrangements and brilliant guitar work. Yes, that means that Adversary's guitarists can actually play a solo. And these solos are epic on 'Hedonist,' 'Singularity,' and 'Manifest Humility' to mention a few. Secondly, when they want to venture into pure thrash metal, Adversary excels, making their forbears proud, as on 'In Vino Veritas.' The bottom line is that when Adversary pursues melodic metal they are at their best. Unfortunately, this caves in on itself because they pursue the worst of American metal. 'Singularity' is singularly ruined by the presences of the dirty/death vocals and the harshness of the metalcore influence. This adds nothing to their creativity or their performance except possibly making them more marketable for current buying trends. The harsh heavy metal of current days is quickly becoming passe and redundant. It will soon be on life support as NWOBHM became in a shorter time. Adversary's 'Singularity' had enough melodic metal moments, in the midst of their post thrash groove metal, to get me listening. In those moments, Adversary shined the brightest. However, current American metal trends raise their ugly heads and get the best of Adversary and 'Singulariy' as it devolves into just another example of American metalcore, a genre whose days are numbered. I believe Adversary has more talent, creativity, and better wisdom to get off that train to obscurity. At least, I hope so. Adversary's 'Singularity' had enough melodic metal moments, in the midst of their post thrash groove metal, to get me listening. In those moments, Adversary shined the brightest. However, current American metal trends raise their ugly heads and get the best of Adversary and 'Singulariy' as it devolves into just another example of American metalcore, a genre whose days are numbered.